The manhunt for a “cop killer” was expanded today to a nationwide dragnet to find the suspected bank robber who fatally shot a Mississippi police officer two days before Christmas, according to the FBI. Tupelo Police Department officer Gale Stauffer and another officer were hit by gunfire Monday when they confronted suspected bank robbers during their getaway in the city. As the officers approached suspects in a vehicle, which was stuck in traffic at a railroad crossing, at least one of the suspects opened fire at close range, according to an account posted online at the Officer Down Memorial Page. The suspects fled, leaving Stauffer fatally shot and another officer critically wounded Stauffer “has made the ultimate sacrifice for his community,” Tupelo Mayor Jason Shelton said, urging the public to help “so that the criminal or criminals responsible for this horrendous act can be brought to justice.” After reviewing bank surveillance video from the robbery of a BancorpSouth bank in Tupelo, authorities are looking for a thin, possibly African-American man with light complexion, standing between 5-feet-9 and 6-feet tall, according to the Mississippi Department of Public Safety. 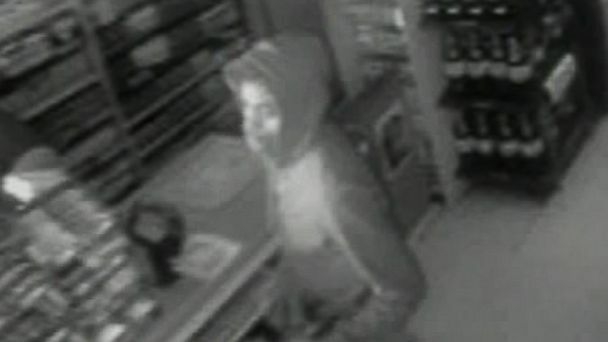 The suspect seen in the surveillance video was wearing khaki or cargo-style pants, white Converse tennis shoes, a long-sleeved jacket and a blue ski mask, the state public safety department said. A charcoal-colored, medium-sized sedan might have been used as a getaway car. As part of the investigation, authorities also released a photo (shown below) of a “person of interest” standing in what appears to be a convenience store minutes before the robbery at the bank. Police did not discuss any possible connection to the bank shooting.More than 100 agents, officers, deputies and marshals worked through Christmas to track down the suspects, an FBI official said. The FBI, BancorpSouth and others are offering more than $152,000 for information leading to an arrest in the case. Anyone with information is asked to call the FBI’s tip line at 1-800-CALL-FBI (1-800-225-5324). Stauffer was a combat veteran of the Louisiana Army National Guard, and he had served with the Tupelo Police Department for eight years, according to the Officer Down Memorial Page. He was married with two young children. The South Shore Convention and Visitors Authority will once again be holding Wag Your Tail Wednesdays in conjunction with the “A Christmas Story” Comes Home exhibit. On Wednesday Nov. 27, Dec. 11, and Dec. 18 from 3:00 p.m. to 7:00 p.m., well-behaved cats and dogs will be able to have their picture taken with Santa. This unique opportunity is offered for $5 per photo and will directly benefit a local animal rescue. Participants are encouraged to bring in donations for the organizations. Additionally, $1 from each pet photo will be donated to the rescue. In addition to Wag Your Tail Wednesdays, Santa will begin visiting the Indiana Welcome Center on Friday, Nov. 29 from 12:00 p.m. to 3:00 p.m. Visitors will be able to get their photo taken atop Santa’s Mountain from 11:00 a.m. to 4:00 p.m. on Saturdays and Sundays leading up to Christmas. Before his yearly flight around the world, Santa will be at the Indiana Welcome Center on Dec. 23 from 11:00 a.m. to 4:00 p.m. and on Dec. 24 from 11:00 a.m. to 2:00 p.m. for photos. Each 4×6 photo costs $5. The “A Christmas Story” Comes Home exhibit, which is presented in agreement with Warner Bros. Consumer Products, will run through Sunday, Jan. 5. The Indiana Welcome Center is open seven days a week from 8:00 a.m. to 5:00 p.m. and is located at the intersection of I-80/94 and Kennedy Avenue South in Hammond. For more information on Wag Your Tail Wednesdays, photos with Santa, the exhibit, weekend and holiday hours or special events, contact Bethany Randolph, special events and services manager for the South Shore CVA, at 219-554-2229 or visit http://www.achristmasstorycomeshome.com. Tags: 219-554-2229, a christmas story, Bethany Randolph, Christmas, Human Interest, Indiana Welcome Center, manager for the South Shore CVA, services manager, South Shore Convention and Visitors Authority, USD, Warner Bros. Entertainment Espana S.L. A window scene from the South Shore Convention and Visitors Authority’s annual “A Christmas Story” Comes Home exhibit will be spending this holiday season at Riley Hospital for Children in Indianapolis. According to Speros A. Batistatos, president and CEO of the South Shore CVA, the organization wanted to share Northwest Indiana’s holiday cheer with the hospital. “Watching the holiday classic ‘A Christmas Story’ has become tradition for many families. We wanted to provide Riley Hospital for Children’s patients and families the chance to experience the annual exhibit during their time at Riley,” said Batistatos. The “A Christmas Story” Comes Home exhibit, which is presented in agreement with Warner Bros. Consumer Products, will open at the Indiana Welcome Center on Saturday, Nov. 9 and run through Sunday, Jan. 5. The Indiana Welcome Center is open seven days a week from 8:00 a.m. to 5:00 p.m. and is located at 7770 Corinne Drive, Hammond, Indiana 46323. Tags: 219-554-2229, a christmas story, Bethany Randolph, Christmas, Geography of Indiana, Hammond, indiana, Indiana Welcome Center, James Whitcomb Riley, James Whitcomb Riley Hospital for Children, northwest indiana, president and CEO, Riley, Riley Hospital, Riley Hospital for Children, services manager, South Shore Convention and Visitors Authority, South Shore CVA, Speros A. Batistatos, Warner Bros. Entertainment Espana S.L. More about the "buy Indiana Christmas Tree "